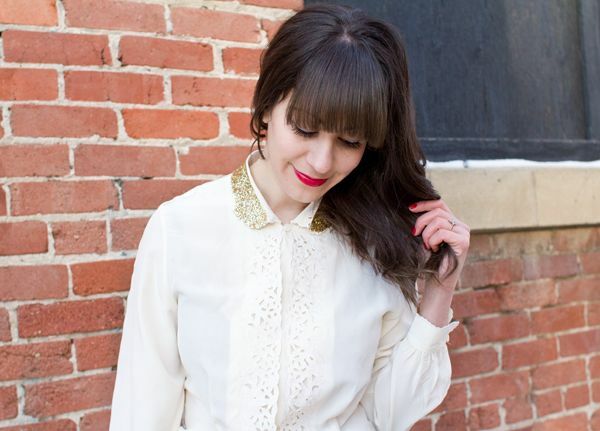 So I kind of have a thing for Mod Podge (evidenced here and here), and since I barely ever wear this vintage blouse, I figured I may as well smear glitter all over the collar eliminating my ability to ever again wash it. Sound like something you might be interested in? Of course it does, because you guys are awesome. 1. 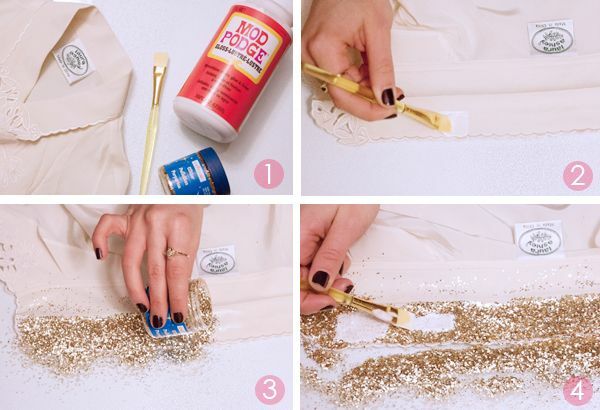 Gather the goods: Mod Podge, glitter, a paint brush and, last but not least, an unsuspecting blouse. 2. Start by ironing a crease onto the collar so you know exactly were the glue should go (I wanted a little white to stay visible, but you can cover the entire collar if you prefer). Once that's done, start painting even coats of Mod Podge onto the collar, working in small sections. 3. Sprinkle a generous helping of glitter onto the wet glue. Repeat steps 2 & 3 until the collar is entirely covered. 4. After the glitter dries (and your glue-related headache subsides), paint a final layer of Mod Podge onto the glitter to cure it. Dry overnight (and get some fresh air— you'll need it) for best results. hahaha you make me laugh.. because as I was reading it I was like she's never going to be able to wash it.. but then you said it! it looks lovely!! Such a fun idea!!! Love this miss! Waw stunning! But maybe not very handy while washing? 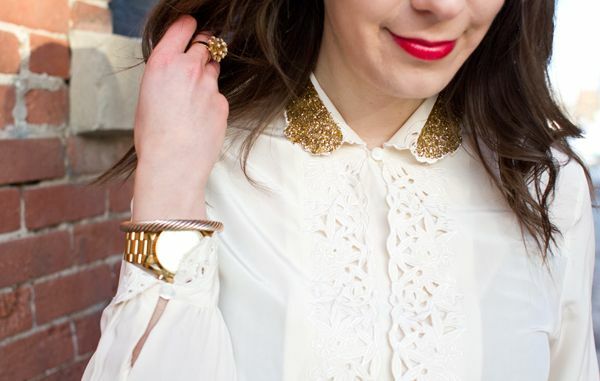 Love it - what a fantastic way to transform a classic blouse!